With the passage of time, the concept of the use of furniture has been changing and creating new norms. Integrated technology furniture has come up with great modishness, upgraded features and functionality. In this article, emphasis on integrated technology equipped in the Computer tables and Coffee tables is focused upon. These tables are considered as one of the most essential requirement for daily routine activities. Integrated technology tables are available in the market in latest styles, designs, materials and attractive colors. Being upgraded with the latest features the table is considered as space savior along with perfect storage facilities for storing Keyboard, printer, CPU and various other stationary items like pen, files, calendar etc. Available in Adjustable sizes: Now days as per the latest trends, computer and PC’s are not widely in use, people are towards laptops. Therefore, materialing on the above trend, these tables are compatible with laptops and available in small sizes. But being equipped with adjustable motions, these can change their size according to the needs and preference of the users. It is the most advanced function available in the system. Ergonomic in nature: Integrated Computer tables are very strong in nature, compatible enough to hold the computer along with its accessories. Due to its availability in wide range of colors and features along with height adjustable option, the tables are easily matched as per the style and designs of your house. Spilt top table: The latest feature enabled, which makes the table technology integrated. The split top table is designed for those people who often use computers and laptops. Being familiar with the storage capacity of these tables, it can be straightforwardly used in other rooms to keep the articles for storage purposes. Integrated technology Coffee table is an amazing conjunction of technology, performing the function of coffee table as well as functions like a computer with touch screen effects. This has become the most elegant and commonly type of table with maximum use at offices and homes. It is available at market in unimaginable styles, categories and designs. Combination of Anti-glare LCD screen and classic wooden table makes it exemplary and unique product of advanced technology furniture. Very similar to tablets, the table performs all the functions of a computer. The table is made up of tough glass surface which is compatible to hold books, remote controls, your coffee dishes etc. The computer is arranged with six touch points to ease the navigation. Due to its water proof features, it is safe for daily usage. The tablet is multitasking with enabled features like 6 GB memory, Bluetooth, Wi-Fi, 500 GB hard disk, wireless, keyboards and mouse. It is also compatible with USB ports, microphone, DVD player etc. The table is no less advanced in comparison with laptop, it is enables with latest windows 8 features. The gadgets are very much in demand due to its latest and attractive features. 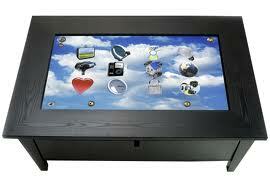 You can start looking around for great integrated technologies computer and coffee tables with Touch screen.